After a prolonged recess from squadron matches, the Fighting 99th Air Wing brings home another win! Congratulations gents! A detailed breakdown of everything that happened is yet to come, but overall it seemed to me that we delivered a strong performance across the board. Thank you to all who signed up and participated! You guys rock. 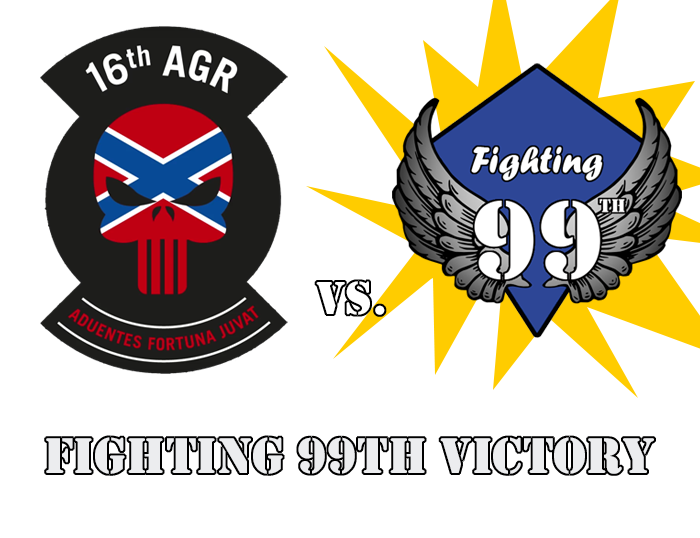 Thank you as well to 16th AGR, our gracious hosts (because when I tried to launch 1.5 DCS on our server I kept landing on a 2.0 main menu) and honorable opponents! They put up a fierce fight and made it a hotly contested match. I think we'll be seeing a lot more of 16th AGR in the future, so keep an eye and an ear out for future matches. Pyro, was that Twitch link you had on Discord this event? Negative, that Twitch stream was ~20 minutes of sitting around waiting and 3 minutes of flight before being Sidewinder-schwacked. Pyro, you were absolutely wrecking them @ CAP. Cas was happy to have you up there!! Well done all! Thanks! It was fun to have 2/3 of "The Doctors" back in action. Just like the good old days versus 929th when we would tag 'em and the ground pounders and helos would bag 'em. And you 33rd guys perpetrated quite a mass casualty incident for their ground forces. I knew it was good when the chatbox filled up with messages from the units you killed, but I had to see it on the Tacview to fully appreciate it. They sent most of their units on the march and you guys annihilated them before they could start making trouble for us. I think it was one of the deciding factors in the match.